Guitar making is not Luthier Lineu Bravo’s only art. Another instrument that he makes with a lot of joy is the ‘cavaquinho’. 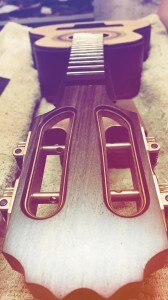 The process is similar; however, it takes some special care because of the small pieces of the instrument. The luthier has to pay close attention to the details so that he can reach the perfect balance. The ‘cavaquinho’ has a special meaning to the luthier: “I really appreciate this instrument since it was the first one that I started playing when I was 10 and also the first one that I made when I was a teenager”, explains the luthier. For the luthier, building cavaquinhos was a big learning: “The cavaquinho is smaller and has a smaller speaker sound, so it demands much more attention to reach the balance and the perfection I need. You have to be much more careful when building cavaquinhos, that’s why it is easier to make bigger instruments”, explains Lineu. When you master the art of making cavaquinhos, you master the art of building all the others: “When I found out the secret of how to have the perfect tuning on the cavaquinho, it became easier to build other instruments”.